April 05, 2019: The Board of Secondary Education, Rajasthan conducts the Rajasthan Board exams every year for class 10th and 12th. This year, the Rajasthan Board exams 2019 for class 10 will be conducted from 14 March to 27 March and the Rajasthan Board 12th class exam from 7 March to 2 April. You can refer to the complete timetable in detail for Rajasthan Board class 10 here and for class 12 here. 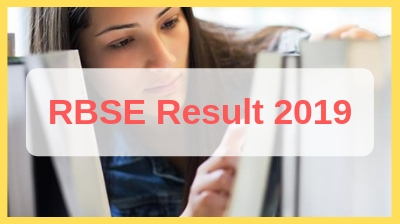 The Rajasthan Board class 10 results for the year 2018-19 were announced in the month of June and the RBSE 12th results were declared in May. This year too, the Rajasthan Board results 2019 are expected to be announced in the same time. Keep checking http://www.examresults.net/rajasthan/ to get the exact RBSE result time and date along with other important details like pass percentage, topper marks and girls and boys pass ratio etc. Look for the desired board button, for example the button that says Class 10 Results Click Here or Class 12 Results Click Here. Click on the link and fill in your details, including Registration Number and Date of Birth, to get your Rajasthan Board Result 2019. Take a printout of your RBSE Ajmer Result 2019. The Rajasthan Board 10th results were declared in the month of June last year. Going by the last 2 years trend, it can be expected that the Rajasthan 10th Board results will be declared within the 2nd or 3rd week of June, 2019. The RBSE 12th class result 2019 for Science and Commerce streams can be expected to be declared by the mid of May following the last year's trend where the result from Rajasthan Board's Science and Commerce results were declared on 15 May, 2017. For Arts stream, the result can be expected by the end of May, 2019 if last year's trend is to be followed where the results were declared in the last week of May. In 2018, the overall pass percentage for Rajasthan Board 10th class was 78.95% which was almost the same for 2017. In 2016, the overall pass percentage for Rajasthan Board 10th class was 75.89% which increased by approximately 3% in 2017 and reached 78.96%. For 12th class, once the BSER Raj board results were out it was seen that the RBSE pass percentage for Arts stream was 86.30% in 2016 which again saw a rise of 3% in 2017. The overall pass percentage for RBSE 12th Arts was 89.05% while for Science and Commerce streams was 93.03%. Where Can You Check Your Results for the Rajasthan Board 10th and 12th Exams? You can check your Rajasthan Board class 10 Results 2019 and Rajasthan Board class 12 Results 2019 from www.examresults.net website along with the official website of Rajasthan Board rajeduboard.rajasthan.gov.in. You can also download our Android App and check your Rajasthan board results on your phone. Bookmark this page (CTRL+D) for future reference. All the best!! BSER or the Board of Secondary Education, Rajasthan was established in the year 1957 on December 4th. A lot of government and private schools are affiliated to this Board. The headquarters of BSER are located in Ajmer, Rajasthan.